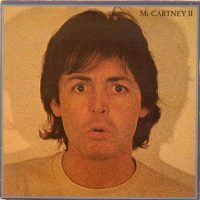 The final song on Paul McCartney 's second solo album stood in stark contrast to the experimental, often electronic songs that came before it. I just like the way he produced this tune, how he double-tracked himself singing, and not a bad job on the guitar! Nice little timing thumps. Beautiful. Great album closer. Cracking lyrics - love how Paul subtlety changes "be" to "see". Another highlight in Macca's catalogue, well worth digging for.